Reverse description: Long cross over square shield. No date. A silver penny of Elizabeth I, (1558-1603). Reverse: CIVITAS LONDON; long cross over square shield. IM: Crescent, AD 1587-1589. North no. 2017. 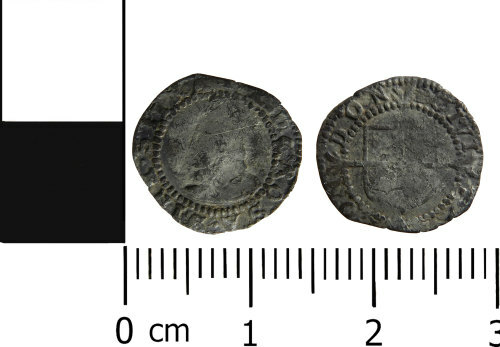 Post Medieval silver penny of Elizabeth I (1558-1603), initial mark probably hand, minted at London, AD 1589-1592, North (1991:137) no.2017.